HODIE (Roman Calendar): Idus Octobres, the Ides of October. MYTHS and LEGENDS: The art image for today's legend shows Hylas and the Nymphs, and there are more images here. 3-WORD MOTTOES: Today's 3-word verb-less motto is Arte non vi (English: By skill, not force). ANIMAL PROVERBS: Today's animal proverb is Ovem in fronte, vulpem in corde gerit (English: He has the face of a sheep but the heart of a wolf). POLYDORUS: Today's proverb from Polydorus is: Divitiae si affluant, nolite cor apponere (English: If riches abound, do not set your heart on them). GREEK PROVERBS: Today's proverb is Ἐχῖνος τὸν τόκον ἀναβάλλει (English: The hedgehog puts off giving birth... but the longer the hedgehog mom waits, the pricklier the little one becomes, and the harder the birth will be!). 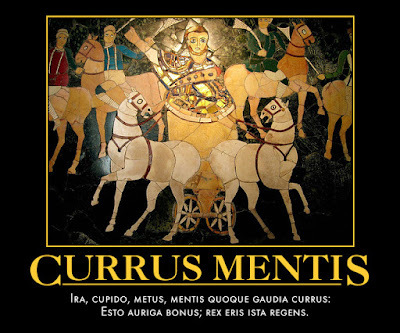 BREVISSIMA: The distich poster for today is Currus Mentis. Click here for a full-sized view. Do wrong to no one. PHAEDRI FABULAE: The illustrated fable from Phaedrus for today is De lusu et severitate, a story about taking time to relax: Latin text and Smart's translation. STEINHOWEL: The illustrated fable from Steinhowel for today is De vulpe, lupo et simio, a story about two criminals who go to court: Latin text and English versions.